Sole has launched a new elliptical trainer called, wait for it, the Sole E35 (2013 Model) to replace the old E35 (2011 model). If you can get past the confusion of Sole re-using the same model number over and over again, the Sole E35 (2013 Model) elliptical trainer lives up to what you would expect from Sole. Due to its heavy duty construction and 25lb flywheel, (the new E35 (2013 Model) weighs over 200 lbs), the machine has excellent stability and a 375lbs maximum user weight, worthy of a Biggest Loser participant. The incline of the elliptical motion can be power adjusted from level to a 30pct incline, greatly extending the variety of your training. 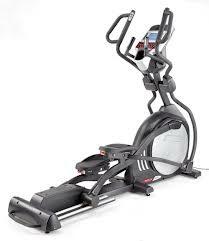 The stride length is adjustable up to a very full 22 inches, making the Sole E35 Elliptical Trainer (2013 Model) suitable for even the tallest user. and the console is also adjustable to accommodate different user heights. As is typical with Sole elliptical trainers, there is not an abundance of training programs though 6 standard, 2 custom and 2 heart rate programs really is sufficient. The Sole E35 Elliptical Trainer (2013 Model) include all the features you would expect, including both contact grips and chest strap for monitoring heart rate, cooling fan and music port with sound system. The Sole E35 Elliptical Trainer (2013 Model) is covered by an excellent warranty, lifetime on the frame, 5 years on electronics and parts and 2 years on labor.